Suffolk officials warned that a Melville man received a call demanding money, and that while he was on the line, another call, apparently from police, threatened him with arrest if he didn't comply. Long Island’s rip-off artists have added a new twist to their use of caller-ID-spoofing software. Now, they are making phone calls to potential victims that look like they are actually coming from cops, Suffolk County officials said Wednesday. Suffolk Police Chief of Department Stuart Cameron said a Melville man told investigators he had received a call Tuesday from a person who instructed him to remain on the line, drive to his bank and await further instructions on how to resolve an outstanding criminal warrant. When a second person called the Melville man during that call, a legitimate number from the Second Precinct popped up on the caller ID. The second caller gave the Melville man a fake badge number and threatened to arrest him if he did not comply with the first caller. Cameron said the calls were actually attempts to scam the man out of money. 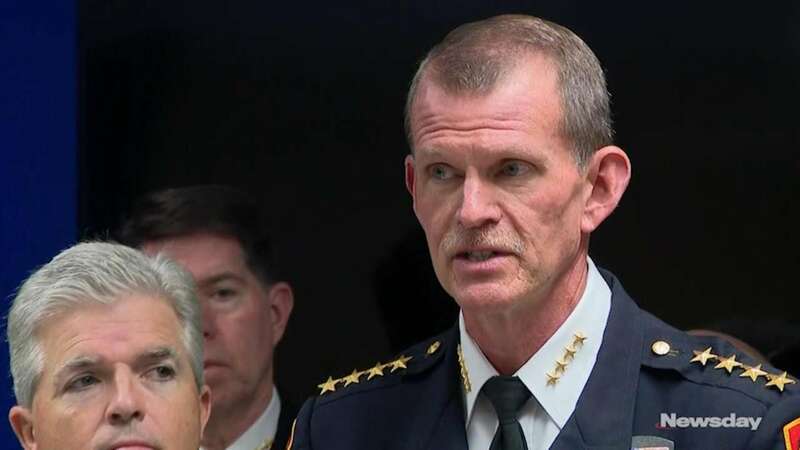 “I want to make one thing very clear: No member of the Suffolk County Police Department will ever call your house or business asking for money,” Cameron said during a news conference at SCPD headquarters in Yaphank. Authorities across Long Island have issued numerous warnings in recent months about phone fraudsters, email scammers and other con artists who try to swindle senior citizens and other residents. Nassau police said Tuesday that they received 138 reports of scams against the elderly last year, a 62 percent increase over 2017. Nassau County Executive Laura Curran and Police Commissioner Patrick Ryder kicked off a series of public forums Tuesday intended to educate seniors on how to protect themselves from crooks who in some cases have stolen tens of thousands of dollars from victims. Sometimes the con artists identify themselves as police officers or lawyers and tell targets they need to send money as soon as possible to bail loved ones out of jail, authorities said. Others claim to be representatives of the IRS or utilities demanding money to settle outstanding bills. The scammers often demand payment in gift cards, a telltale sign that they are not legitimate cops or representatives of government agencies, Cameron said. Suffolk County Executive Steve Bellone said perpetrators use spoofing software to mimic calls or texts from potential victims’ employers, friends and relatives to request cash and gift cards. “These scammers are sophisticated, they are very persistent,” Bellone said.